We encourage all our Gr. 9s to participate in the annual “Take Our Kids to Work Day” on Nov. 2. This program supports career development by helping students connect school, the world of work, and their own futures…all of which are key to successful post secondary pathway planning. 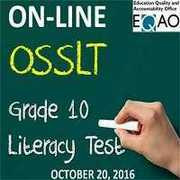 ... Continue reading "Nov. 2 – Take Our Kids to Work Day"
The online trial for the Ontario Secondary School Literacy Test is this Thursday, Oct. 20.